New Bodom. New Bodom! 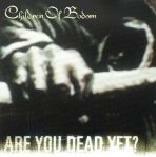 NEW CHILDREN OF BODOM! God, the waiting never gets easier and it always seems to take too long. But Are You Dead Yet? is finally here after the over two year wait since Hate Crew Deathroll. How are things in the land of COB right now? A bit different, and the quality depends largely on the listener. Technically, the band is still superb and one the most tight live outfits out there for sure. The fact that Finlands thrash guitar legend Roope Latvala is the bands rhythm guitarist says a whole lot. The inclusion of Latvala (of Stone-, Sinergy- and Waltari-fame among others) can be heard well on the thrashier parts that abound. Those who longed a return for the classically-tinged days of Hatebreeder, sorry but you will largely strike out. Those who enjoyed the straight-driving and rockthrashing leanings of HCDR, should be very satisfied. AYDY? Also includes some stylings of industrial and metalcore in the mix. The opener Living Dead Beat starts pumping with Janne Warmans very Pain-esque keyboards and chugging chord work, that blasts into a trademark Bodom-riff that grooves marvellously. Groove is a very prevalent element here, evoking big Pantera-vibes through the album, which to me is nothing short of fantastic. The title track that follows begins with pretty thrashing riffs that lead off to Jaskas double bassings and a moshline-inducing beat. The focus of the song is on the great chorus, that sticks in your head instantly. Gang shouts also always get pluspoints from me. Warmans keyboards lace the backgrounds very well. If You Want Peace…Prepare For War pushes the pedal to the ground and speeds away with an awesome drive. The interplay of the guitars and keyboards could be straight off Follow The Reaper. Alexi and Janne rip away till their fingers bleed. One of the albums top tunes. Punch Me I Bleed continues on the path of Everytime I Die and Angels Don’t Kill as the doomy, slow bulldozer, all the way to the fact that like the previous representatives, Punch Me is also an awesome tune with the Pantera/Sabbath-leanings and the keyboard melodies. The atmosphere is magical as the drums change between random strikes and the sludgy beat. Alexi really screams his lungs out on this one and there are also peculiar Wilska-like deep, bassy vocal harmonies in the middle, very similar to the ones in Nightwish´s Pharao Sails To Orion. Returning to Laiho, his singing hasn’t changed much to the style on HCDR, maybe a bit more harsh, but at the same time with more clarity as its fairly easy to make sense of the lyrics. The first single In Your Face I already covered quite well in the single review, so here Ill just repeat that’s it’s a very killer tune, especially the chorus. Next In Line starts off with a bit uninspired ramming, but once the song hits the mosh-grooves that hit after the chorus, my neck muscles are taking a non-stop beating from the excessive movement, and some discs in the spine are bound to lodge out of place. In the end, the tune is marvellous, after you get used to the mediocre start. Bastards Of Bodom could be lifted right from HCDR with the thrash elements and chugging riff-blasts. The song is allright, although probably the most mediocre one in the bunch. Trashed, Lost & Strungout is still my favorite tune off the record, as I dug the living Lucifer out of it already on the EP. The speed, magnificent riffs, infectious vocals, great intertwining keyboards and the driving aggression really blast home one the best Bodom-songs ever in my books. The grooves after the chorus are so insanely moshable that it should be outlawed, or at least enabled to get insurance policies on the grounds that its hazardous to the spinal area. Awesome solo as well. The closing tune Were Not Gonna Fall has a bit of a leftover feel of trying to copy the title tune of Hate Crew Deathroll too hard. The guitar-keyboard riffings work well though. Warman is used much more and more effectively on the album then on the previous album, which is a good thing. I also like the harder bass sound that Henkka is using, bringing the bass really up in the mix at some points. The production as a whole is very strong, and really supports the crunch of the material superbly. All in all, Children Of Bodom does not dissapoint me – not by a long shot. I wouldn’t be surprised if this record divides older fans even more the HCDR, as the modern leanings are even stronger. The songs are also even more straightforward and rock-oriented, which I don’t mind by any means. I like it a lot. Solos still abound, the songwriting is in fine form and the band grooves brutally well. The loudest minus could be that the lead guitar melodies that often backed choruses and verses have been reduced in favor of more balls out-riffing, which partially works, partially not. I still wouldn’t say that this is my favorite Bodom-record, but unfortunately the giveortake 20 listens that Ive had time for aren’t really enough to judge it on that excellent. An excellent album it is anyhow, and one that certainly got better the more I listened to it, a sign of a durable album for sure. I believe this album also draws in a lot of new fans. Hails for COB, I salute thee with glee again!